What a fabulous 3 days we had at Goose Island State Park! We had plenty of things to see to keep us busy. The first morning I spotted these Roseate Spoonbills in the nature viewing area at the end of road in our campground. Everything is bigger in Texas! A must see in Goose Island State Park is the Big Tree. This 1,000 year old Texas Live Oak is the largest of its kind on public land in the state of Texas. The live oaks here are not as tall as the ones in coastal Georgia because the gulf breeze affects their height. The tree measures 11 feet across the trunk, 5 feet around, is 44 feet tall, and 89 feet across the crown. The tree is surrounded by a fence and is well taken care of. While we were looking at the tree we met a delightful native Texan who has been coming here all her life. She remembers when her 15 year old son could climb on the tree. She also told us a story of her grandfather or great grandfather (I don’t remember which) caught a record sting ray and has a picture of his record catch hanging in the big tree! These days no climbing on the tree is allowed. Fishing is very popular here and we enjoyed going to the dock when the boats came in. We saw White Pelicans hanging around the docks waiting for a handout every day. Hey, you’re in our space! One pelican got a free lunch. There was a lot to see in the state park. We enjoyed seeing the sights around Rockport and Fulton. Our favorite drive was along Fulton Beach Road with homes on one side of the road with their docks jutting out into the bay on the other. Many of the homes were beach cottages with windswept oaks in the front yard. It felt like we had stepped back in time before condos and highrises became the norm along the coast. Of course we had to try some of the local restaurants. Lunch at Moon Dogs on the docks in Rockport was fun. My fried soft shell crab salad was delicious. Our last night we had a feast of boiled crab, heads on shrimp, crawfish, sausage, potato and corn cooked with a Cajun seasoning. The servers poured it all on the butcher paper covered table like we serve our low country boil back home. Delicious and fun! 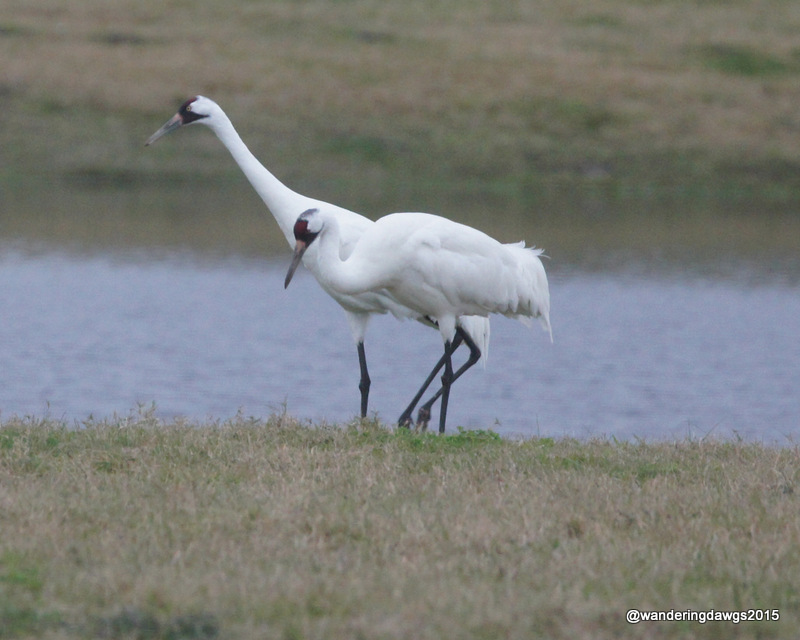 Our main reason for coming here was to see some endangered Whooping Cranes. We saw them every day and they are so spectacular they deserve their own post. Here’s a preview of those magnificent birds. Look for another post coming soon. We camped in site 34 of the Bay campground near the nature viewing area. There are more sites near the fishing pier The sites are on hard packed sand right on the water. Each site has water and electric hookups and a shelter with a picnic table. Many people fish right from their campsite. Spoonbills, white pelicans, and whooping cranes all in the same post…wonderful! This seems to be a must-see place if in the area. And we also. saw Sandhill Cranes there! Yes, it is a must see place. And having a waterfront site made it even better! Wish we could have stayed longer. Now that is a tree! So glad they are protecting it. Think of the things it has experienced. The roseate spoonbills are such a joy to see. And the tree was amazing. Hard to imagine it is at least 1000 years old! I’m so glad you enjoyed the area. I always hesitate to make recommendations because not everyone enjoys the same travels, but I had a feeling this would work for you. Can’t wait for your whooper post. Great post and fabulous pictures! I was wondering how you and Ingrid got such fabulous pics-now I see she was here, too! We can’t wait to get there one day. We loved the state park and the Rockport/Fulton area. If we didn’t have so much of Texas still to see we would have stayed longer! Wonderful post Beth! Loved all you photos, especially the White Pelicans. The shot of the Sandpiper with the crab in it’s beak was super. Looking forward to the Whooping Cranes post.